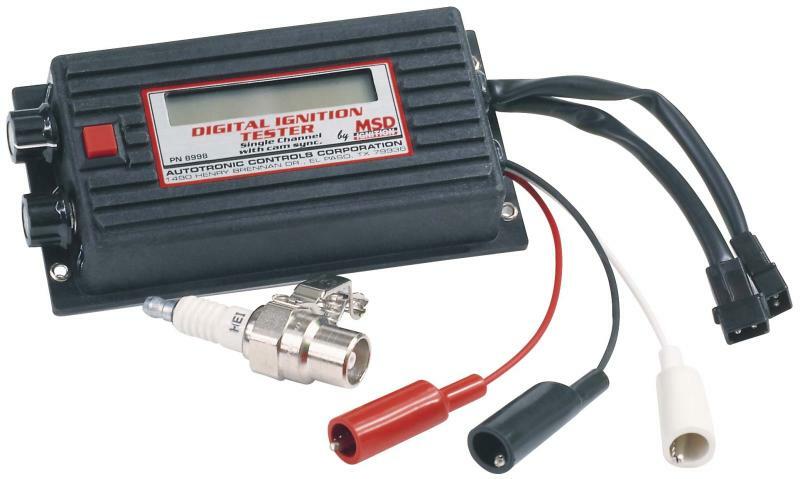 MSD Digital Ignition Tester – Psrt# 8998 – Every racer’s toolbox should have an MSD Ignition Tester. This handy tool allows you to check the entire ignition system while it is in the car! Once the ignition tests good, you can continue troubleshooting and find the culprit. MSD has offered an Ignition Tester for several years and for 2000 has upgraded it with a microprocessor and several other new features. The Tester produces a simulated trigger signal that fires the ignition just as if the engine were running. A special, load producing clip-on spark plug is included to connect to the coil wire. If the spark is unable to jump the gap of the tester, there is an ignition problem and you can trace it down. For racers with our new Programmable 7 Ignition Control that are using the Individual Cylinder Management system, the Digital Tester has a circuit to check the operation of the Cam Sync signal too. The Tester has an LCD display that clearly shows the simulated rpm. This also allows you to test the accuracy of any rpm limits, rpm activated switches, shift light operation and your tachometer. The Tester operates on 4, 6 or 8-cylinder engines and will simulate up to 10,000 RPM. Digital Multi-Channel Ignition Tester – Part# 8996 – If a race car hesitates or burps on the track, the first thing that is suspect is the ignition system. A few years ago MSD introduced a tester to clear the ignition of guilt and to save racers time when troubleshooting. This new Digital Tester combines the experience of the original tester with digital technology and multi-channel capability! This new Ignition Tester will check everything from the new MSD DIS Ignitions to the race-only MSD 10! The tester will trigger through a points style input (White wire) or with the magnetic pickup (2-Pin connector) from the MSD Ignition. By connecting the coil wire to the supplied load bearing test plug you can test the ignition and coil(s) while everything is installed on the car! The Tester is easy to connect with firm grip alligator style terminals and matching ends for the trigger inputs. The LCD Alphanumeric readout shows the simulated rpm so you can easily confirm rev limits or the operation of an rpm activated switch. It can be used on 4, 6 and 8-cylinder engines. Midget Tester – Part# 8994 – For in the field testing of the Midget Ignition, MSD developed this handy Tester. 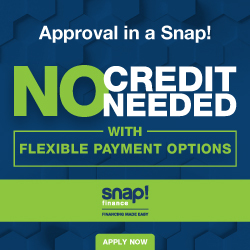 It plugs into the Ignition Control and simulates a trigger signal to fire a test plug out of the coil to confirm the operation of the ignition and coil pack. It can also be used to confirm the timing curve you program by running it with the ignition connected to a laptop for view changes in real time!